The Glen site is composed of different hospital centres. The Montreal Children’s Hospital has two distinct blocks (Blocks A & B) and the Adult services have three distinct facilities, namely: the RoyalVictoriaHospital (Blocks C & D); the Montreal Chest Institute and the Cedars Cancer Centre (both in Block D). 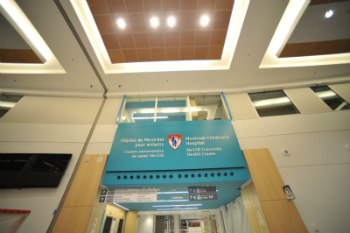 Montreal Children’s Hospital (MCH) ambulatory services provide pediatric outpatient services carried-out by an inter-disciplinary team of professionals. 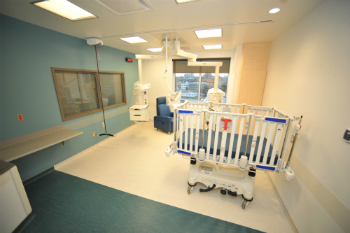 Some of the Allied Health Services are found in Block A.
Montreal Children’s Hospital (MCH) services in Block B include all pediatric inpatient units including the Neonatal Intensive Care Unit (NICU) and Pediatric Intensive Care Unit (PICU) . This block also houses the pediatric emergency department, operating rooms and perioperative services, day hospitals and some Allied Health Services. 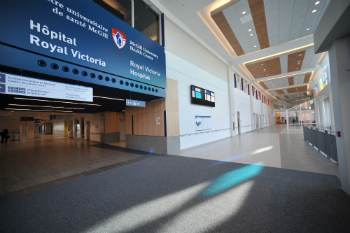 The Royal Victoria Hospital (RVH) located in Blocks C and D is designed to respond to the medical needs of adult patients. Most of the ambulatory services, including the Emergency Department, Medical Imaging, and the Medical and Surgical Clinics are located on the lower levels (S1 - 2). All operating and interventional rooms, recovery bays as well as a 35 bed intensive care unit are located on the third level. The sixth level is dedicated to the Women's Health Mission and the inpatient units are located on the upper levels (7-10). GET A PHOTO TOUR OF OUR NEW HOSPITAL!